The miniature circuit breaker (MCB) has replaced the fuse in incoming distribution boards since the 1960s, so increasing incoming protection by making it impossible to bypass blown fuses with nails or wire – a frequent and dangerous practice. An MCB is a mechanical switching device able to make, carry and break currents under normal circuit conditions and breaking currents under specified abnormal circuit conditions such as overloads or short-circuits. 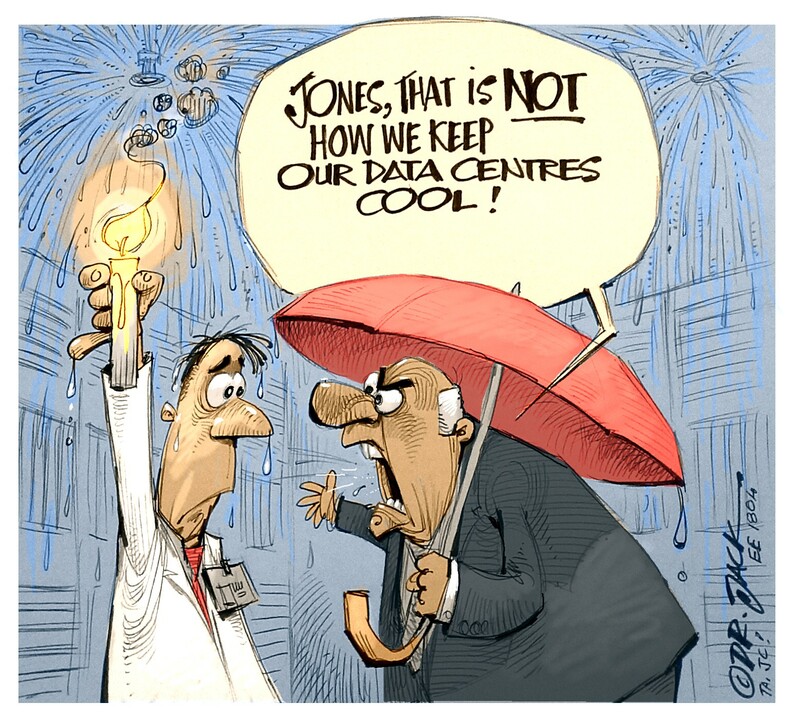 The MCB must operate with safety for the user and the environment and without damage to the electrical installation. The switching mechanism forms the main current path from the line terminal connection to the load terminal connection (see Fig. 1). It includes special contact tip materials to handle the arc energy on make-and-break operations. The arc runners lead the arc away from the contacts and into an arc grid arrangement designed to split the arc between the iron plates, thereby increasing the arc voltage – generally 10 V per arc foot – to a point where the system voltage is too low to sustain it and would cause the arc’s collapse. This chamber also plays an important role in exhausting the hot gases away from the incoming line and the delicate trip mechanism. The mechanical trip mechanism is a delicate set of spring-loaded levers connecting the moving contact through a latch to the operating handle, allowing the MCB to be switched on and off manually. However, when acted upon, the latch automatically disconnects the moving contact from the incoming supply. The overload control mechanism determines at what current and for what period of time the MCB will disconnect from the incoming supply in the case where the rated current of the MCB is exceeded. In this aspect, there are two different technologies available. The main element in a thermal magnetic MCB is a bi-metallic strip which is heated by the passage of current through it, causing it to bend and bias onto the main latch. The latch is released at a predefined temperature, causing the main contacts to separate (see Fig. 2). 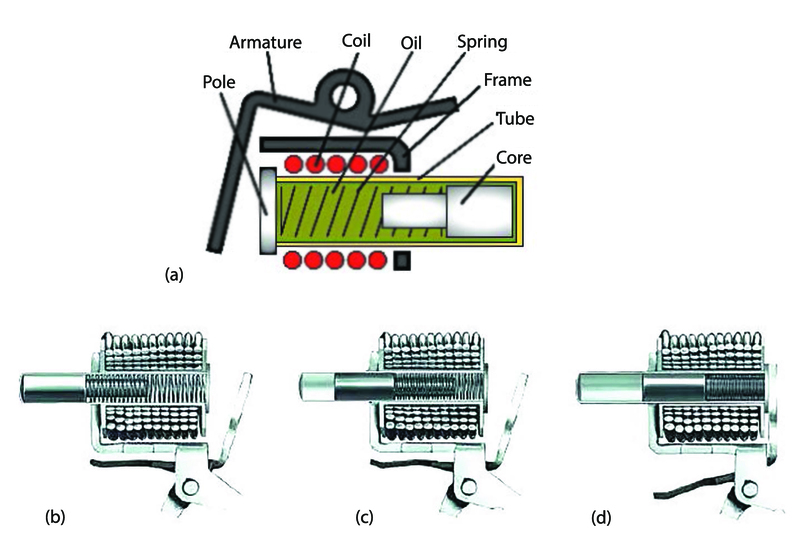 In this design, the bi-metallic strip is replaced by a “dashpot”, which is an oil-filled tube containing a spring-loaded iron core (see Fig. 3). The current is passed through a coil placed around the tube. A spring-loaded armature, an iron frame and an iron pole piece complete the magnetic circuit. As the current increases past the rated value of the MCB, the core is attracted towards the pole. Once the core reaches the pole, the armature is attracted towards it and this causes the latch to trip and the contacts to separate. Voltage rating: 230/400 V (+/- 10%) – 50 Hz. Current ratings: From 1 to 100 A (1; 6; 10; 16; 20; 25; 32; 40; 50 and 63 A being most common). Overload characteristics: Curves B, C and D.
Breaking capacity: 3, 6 and 10 kA alternating current (single phase and 3-phase). 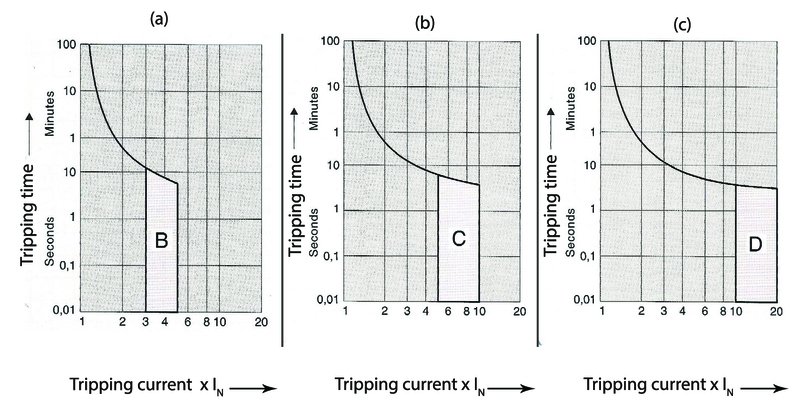 The function of an “inverse time delay curve” is to ensure that the time to “trip” or disconnect is progressively less as the overload increases (see Fig. 4). This ties in with the principle that the installation wiring and/or appliances at increasing fault levels can tolerate a limited amount of overload energy. In addition, many appliances demonstrate a current inrush when switched on – electric motors, in particular, have an inrush of around 10 to 15 times the rated current for a short duration of time; the MCB must be able to allow this without tripping. These curves demonstrate the instantaneous tripping point – the current beyond which the MCB offers no practical time delay and is said to trip instantaneously. The lower this value, the more likely the MCB will trip on start-up of any electric motor. As mentioned previously, the thermal MCB is affected by ambient temperature and the proponents of this technology argue that this is beneficial since, at higher temperatures, damage is more likely to occur to the installed cables and a reduced trip characteristic is therefore desirable. Another subtle technical differentiator is the MCB’s inherent design, which enables it to limit the let-through current under short-circuit conditions. The design of the tripping mechanism is enhanced to accelerate the moving contact opening speed and the effective dissipation of the arc into the arc chamber. This is referred to as either a current-limiting or zero-point extinguishing breaker. Rated short-circuit making capacity (Icm) if higher than Icu. Rated insulation voltage (Ui) if higher than Ue, i.e. 500 V.
Pollution degree, if higher than three. Conventional enclosed thermal current (Ithe) if different from the rated current. Further items for large-frame MCBs. Further items for opening and closing devices for large-frame MCBs. Type designation or serial number. IEC (SANS) 60947-2 or VC 8036. Selectivity category, e.g. “Category A”. Rated operational voltage (Ue) in Volt, e.g. 250 V.
Rated impulse withstand voltage (Uimp) in kV, e.g. 4 kV. Rated frequency, e.g. 50 Hz (note that there are special requirements for DC types). Rated service short-circuit breaking capacity (Ics) at the voltage Ue, in kA, i.e. 6 kA. 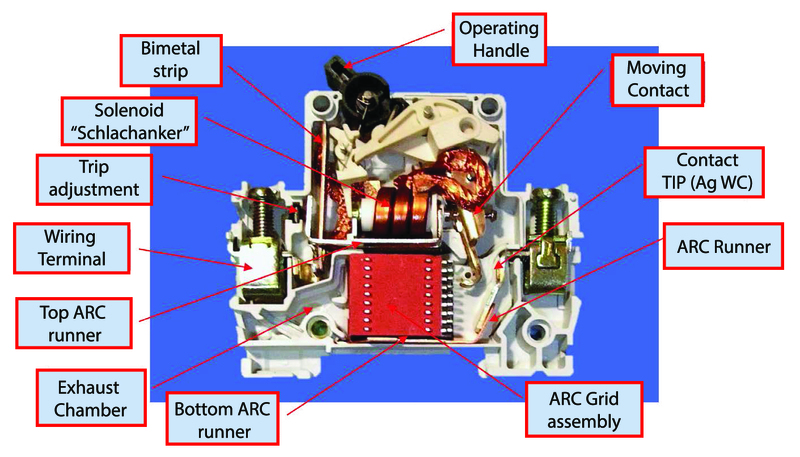 Rated ultimate short circuit breaking capacity lcu) at the voltage Ue, in kA, e.g. 10 kA. Note that this may be given in the form Ics = Icu = 6 kA, or Ics = 0,5 Icu = 3 kA. Line and load terminals, unless their connection is immaterial. Reference temperature for non-compensated releases, if different from 30°C. Rated current (In) in Ampere, e.g. 20 A. In some instances this is coupled to the DIN time delay curve designation, i.e. for curve Type C: C 20 A. Indication of the open and closed positions with the symbols I and O.
Manufacturer’s name or trade mark. This is usually on the front and visible to the user. To distribute the product, manufacturers or importers of MCBs up to 10 kA / 125 A must furnish a valid test report issued by an accredited test laboratory, proving that the product complies with the requirements of VC 8036. A Letter of Authority (LoA) issued by the National Regulator for Compulsory Specifications (NRCS) on the strength of the accredited laboratory’s test report is also required. Insist on being informed by the supplier about the origin of the product and, where applicable, by the consulting engineer or electrical contractor about available choices. Be critical of their choice if you have any doubts. Ask for proof of compliance with regulations. Deal with a supplier and brand you know and trust. Look for the markings and information details mentioned here – if absent or deficient, be suspicious. Look for certification such as SABS or VDE marks. Look for the test specification marking: “Tested to SANS or IEC 60947-1 or VC8036”. Try to validate “sales talk” about quality and performance. Make contact with the original supplier in South Africa. Beware copies of prominent brands. Beware products at substantially lower prices than others. Look for the SAFEhouse logo on the packaging.